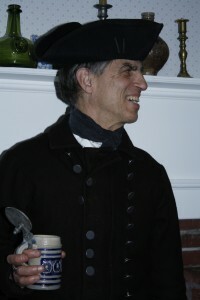 Neill De Paoli in 18th century dress/kit, at home, Kittery, ME. I grew up in upstate New York in an area with a rich prehistory and history. The Mohawk River Valley was home to Native Americans for over 7,000 years and Dutch and English settlers by the late 1600s. I have fond memories as a boy exploring the grounds of the Saratoga National Historical Battlefield Park and the back streets of downtown Schenectady that was home to a small Dutch farming and trading town over 300 years ago. I have followed my childhood fascination with history into a career as a professional historian and archaeologist. For the last 40 years I have studied and written about English settlement and Anglo-Indian and English-French relations in early northern New England. This past year I fulfilled a longtime dream of working for the National Park Service when I was hired as a seasonal interpretive park ranger for the National Park Service at the Minute Man National Historical Park in Lexington, Massachusetts. I return to the historic park for my second season this June. The Minute Man National Historical Park is a beautiful, sprawling 970-acre complex that includes two visitor centers, more than five miles of the historic Battle Road, nearly two dozen colonial-era houses and the ruins of countless other early homes set within a blend of fields, woodlands, and marshlands bisected by the Concord River. The more than one million people that visit the park annually walk through a historic landscape much as it appeared on the morning and early afternoon of April 19th 1775. What has made my experience as an interpretive park ranger so enjoyable has been working at a historic park so closely tied to the origins of the United States. There is nothing more exciting than walking down the same road and passing by some of the same houses that the British regulars did on their early morning march on the Bay Road to Concord and their afternoon retreat back to Boston. 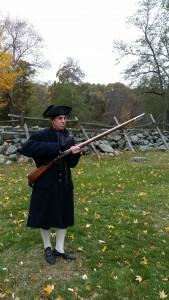 Performing musket firing demonstration – prime & load, Hartwell Tavern, Minute Man National Historical Park. I often lead outdoor presentations unraveling the bloody confrontation between British regulars and local Minute men and militia at the North Bridge and the running battle that followed. I focus on connecting the audience to the unfolding “story,” making them feel that they were part of this historic event as civilian bystanders or American or British military participants. I especially enjoy how the audiences view the events that unfolded on April the 19th. 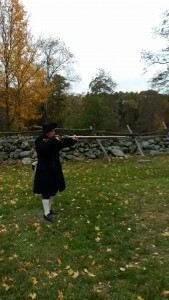 Performing musket firing demonstration – firing, Hartwell Tavern, Minute Man National Historical Park. The highlight of my season is my time spent as a historic reenactor depicting a Minute Man posted at the Hartwell Tavern. This dwelling and tavern was home to the family of Ephriam and Elizabeth Hartwell. Their three sons Samuel, John, and Isaac were part of a company of Minute Men that fought in Concord on April 19th. The Hartwell tavern was also one of several “witness” houses that the British troops passed by on the Bay Road on their way to and from Concord. As a Revolutionary War reenactor, I am dressed and equipped as the three Hartwell men were when they rushed out to join their comrades on the early morning of April the 19th; civilian clothing, felt hat, musket, cartridge box, powder horn, bayonet, and wooden canteen. For the next 6 hours I join my reenactor comrades as we take turns explaining to the often large crowds of children and adults what it was like being a Minute Men in the months leading up to the outbreak of the American Revolution at Lexington and Concord on April 19th 1775. For both the reenactors and the audience the highlights of the “Who Were the Minute Men” program are the audience joining the Minute Man reenactors in a 10-minute military drill followed by a live musket firing demonstration. The end of my work day is nearly as enjoyable and satisfying as the previous 8 hours. I often unwind by walking the grounds of the Minute Man National Historical Park. Oft times, I walk a couple of miles down the Battle Road where I enjoy the quiet and the slowly setting sun while I explore the ruins of some of the houses flanking the Battle Road or the sites of the “fire fights” that took place between the British regulars and the Minute Men and militia at Merrian’s Corner and Bloody Angle. How fitting for me that I now work at a prominent Revolutionary War site that I could only dream about as a boy.